Steam’s Lunar New Year sale has once again brought fan favourites back into the Weekly Top Ten. Regular faces still make a show, of course, with Grand Theft Auto V topping the list, while The Witcher 3 makes another sale return to the Top Ten, taking the No.2 spot. Playerunknown's Battlegrounds and Monster Hunter World follow not far behind at third and fourth places, respectively. 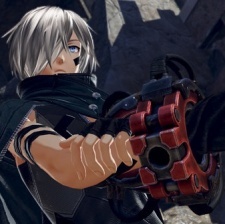 A notable newcomer, Bandai Namco’s action-RPG God Eater 3 launched last Thursday to take a bite at No.5. The only other real breakthrough entry in this week’s chart is pre-order sales of Civilization VI’s second expansion Gathering Storm, closing out the list at No.10. Finally, Resident Evil 2 proves it can withstand more than a few blows from the big players. The spooky sequel takes No.8 this week, six spots down from its chart-topping dominance last week. Given the hype surrounding Capcom's remake of the 1998 classic, no doubt it'll be sticking around in the Top Ten for some time yet. Below is the Steam Top Ten for the week ending February 9th.